Anyone would think my family subsists on mashed potato* - well not quite - although we are rather partial to it. Invariably we always have leftover mash so I am always working out ways to use the leftovers the following day as part of my OCD-can't-throw-food-away personality. We're also partial to good breakfast/brunch grub. In fact one of the big things we miss about living in the US is a good diner breakfast. Home fries, nice runny egg (sunny-side up of course!) and crispy bacon...or eggs benedict. Yum. I'm hungry just thinking about it. All in all it means that if we have time breakfast can become a big deal in our house. Saturday I was in cleaning mode and had my eyes on the fridge that really needed a deep-clean (q-tips at the ready people!). In order to get the job done I was trying to empty the fridge as much as possible. I was looking at leftover mash, white cabbage, bacon and eggs. No thinking required, Bubble and Squeak seemed obvious. I'm not quite sure of the origins of Bubble and Squeak but as far as I can tell its a pretty traditional British dish that involves mashing/mixing all your leftovers together and frying them up. Most people go for the mash/cabbage mix (certainly my folks do) so it seemed like a logical choice. 2. If you do not already have cooked cabbage start by cooking the cabbage. In a saucepan heat a tablespoon of butter with a tablespoon of water until the butter is melted (I recently learnt this trick - it apparently emulsifies and coats the cabbage to give it tons of flavour - it does and I could happily eat just a bowl of cabbage cooked this way). Put the shredded cabbage in the pan and cook until wilted. 3. 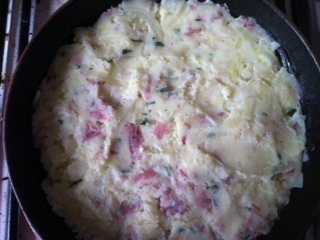 In a large bowl, put the mashed potato, cabbage, bacon, onion powder, basil, salt and pepper and mash it all together with a fork until the ingredients are well combined. 4. Butter a small oven-proof frying pan and warm over a medium heat. Mash the mix into the frying pan and press firmly down. Then cook over the medium heat until the edges start to brown (about 5mins). Dot butter all over the top and put the pan in the oven for 10mins. 5. In the interim, in a separate frying pan fry the egg sunny-side up until the white is cooked. Unless you really don't like a runny egg please please please put a runny egg on top! 6. You may want to put the Bubble and Squeak under the grill to get the top nice and brown if it hasn't browned enough. Ease the Bubble and Squeak out of the pan and serve with the egg on top! The recipe above serves 1/2 people depending on whom you're cooking for or if you do anything else with it. Hubster wanted it all for himself so this served 1...equally we could have served half each with some sausages or beans (Heinz of course!). Whatever you fancy. *For example, the uber yummy sausage cakes. I have never had bubble and squeak with an egg, interesting. We have always had as dinner, but sure why not have for breakfast. To be fair it was more brunch than breakfast but certainly I'm always happy to explore a hearty breakfast! Go on...try it! I do sooooo like bubble and squeak, and it has been too long since I made it. Thanks for reminding me of its greatness! Cool blog! My absolute pleasure! Thank you very much for swinging by. I had a quick jump over to your blog - really like your style to hit you up with a follow!